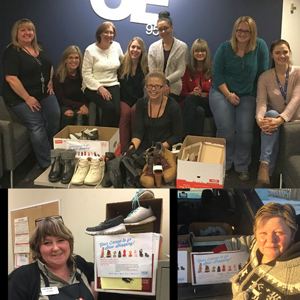 Calgary – December 15, 2016 – For the second year in a row, in honour of the December 6 National Day of Remembrance and Action on Violence Against Women, UFCW Canada members in Alberta stepped up to the plate to help victims of gender-based violence by collecting shoes for local women’s shelters as part of a province-wide shoe drive. In an effort to raise awareness of violence against women in Alberta, and to help women who have survived domestic violence, UFCW Canada Local 401 and Local 1118 members collected and donated gently worn women’s shoes to local area women’s shelters across the province. Last year, UFCW Local 401 members were able to collect 35 pairs of shoes that were donated to LaSalle, a “second stage” shelter located in Edmonton. This year, activists drastically increased that number by collecting nearly 1,000 pairs of shoes. Following this year’s shoe drive, a presentation of shoes was made to Wings of Providence Fund Development Assistant Sarah Filshie-Palmer. At the presentation, Sheena Thomson, Chair of the UFCW Canada Local 401 Women’s Committee, spoke to the media about UFCW’s involvement in National Day of Remembrance and Action on Violence Against Women, as well as UFCW 401’s efforts to commemorate the day locally. Filshie-Palmer said was very impressed by the extraordinary work of UFCW Canada Local 401 members, and the Women’s Committee in particular. Other shoes were presented to local shelters in Hinton, Sherwood Park, and Lloydminster. All were donated by the incredible UFCW Canada Local 401 and 1118 members in each town. Every year, the number of women requiring shelter services continues to grow in Alberta. According to the Alberta Council of Women’s Shelters, more than 10,000 abused women, children, and seniors accessed shelters in the province in the 2015-2016 year.